There are few fans out there that are more devout than Harry Potter ones. I should know, because I was *this close* to booking surprise tickets for my wife to London just to watch the premiere of The Cursed Child, but I had to pay for her grad school, so, yeah, I guess the gift of education is better in the long run. (I still have my doubts). 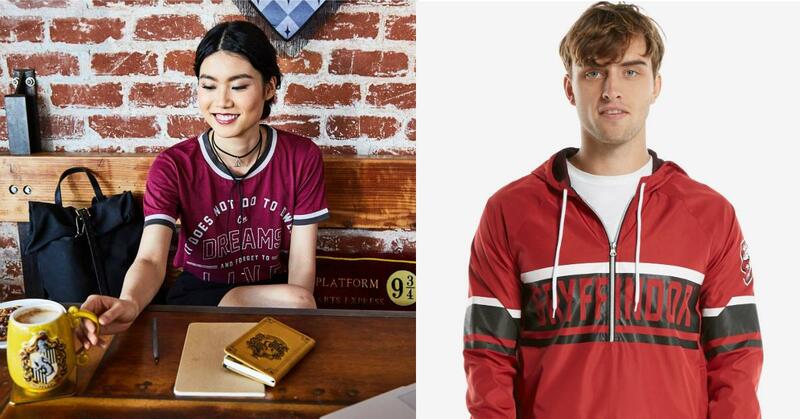 So if you are a fan of J.K. Rowling's iconic series, then there's some good news for you: BoxLunch just released a new line of Potter-themed clothing and accessories and, although I'm running the risk of sounding like an advertisement, pretty much everything they've got on their site looks awesome. What's cool about BoxLunch too is, as indicated by their name, for every $10 that's spent on their site, they donate a healthy meal to a person in need, thanks to their partnership with Feeding America. So if you wanted to feel like a humanitarian while indulging your love for purchasing Potter-themed items, then shop away. While other stuff is full-on geek, like this deathly hallows necklace. The accessories they have are pretty incredible, too. You can rep your favorite Hogwarts house. Along with baseball caps that pack some references fans will swoon over. And I know you're just fiending for this backpack that looks like an invitation from Hogwarts, along with a replica wand. And if you wanted some Quidditch goggles, for whatever reason, or some Potter-esque wire frames, well look no further. You can check out all of the awesomeness here.